This is what the desk and chair looked like before. This is the picture my neighbor took on her garage sale day. Here you can see it's in my very mess work space in the basement! 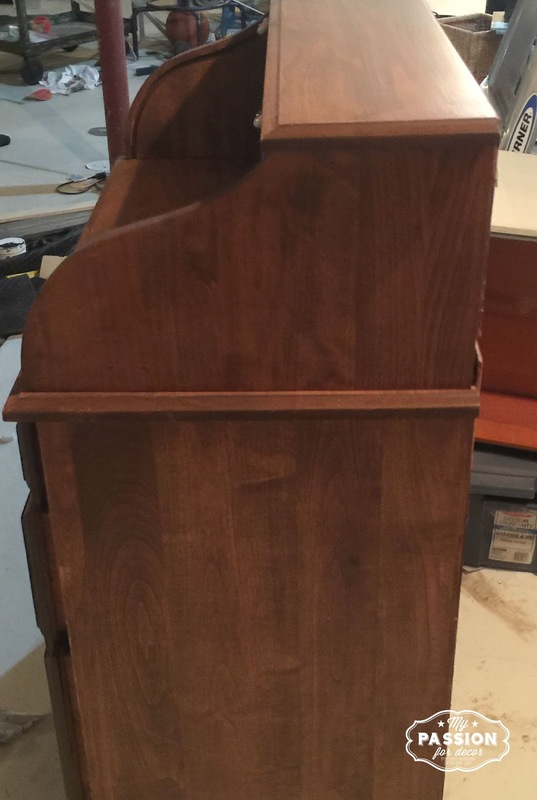 When I started this project I didn't really know what I was going to do to the desk. I knew it needed pant, but other than that I didn't have an inspiration. 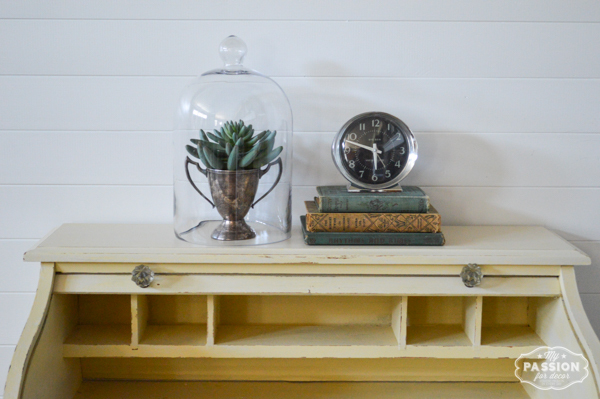 I looked at the paint I had on hand and found one of my all time favorite paint colors, Cream Chalk Paint™ decorative paint by Annie Sloan. I've used this color a lot. It's a beautiful buttery yellow and it's soft and pretty. Once I started painting the desk, inspiration struck! 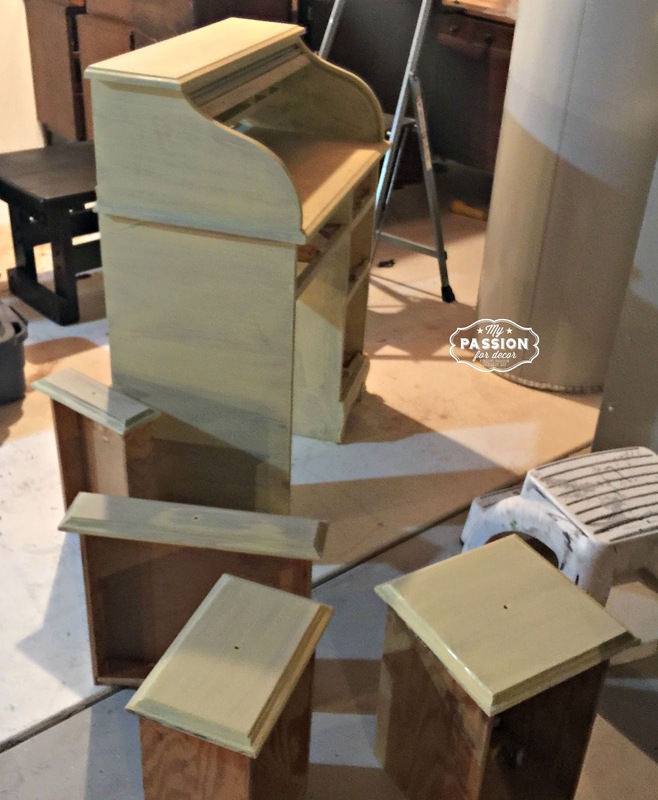 For the chair, I used my HomeRight Finish Max Sprayer. I'm not a huge fan of painting chairs, so the sprayer made quick work of this piece. 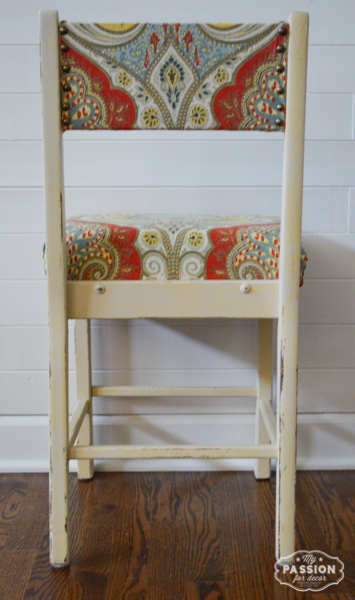 After I sprayed the Chalk Paint™ I went over the chair with a brush to give it some brush marks. I like the look and since I was hand painting the desk I wanted them to match. 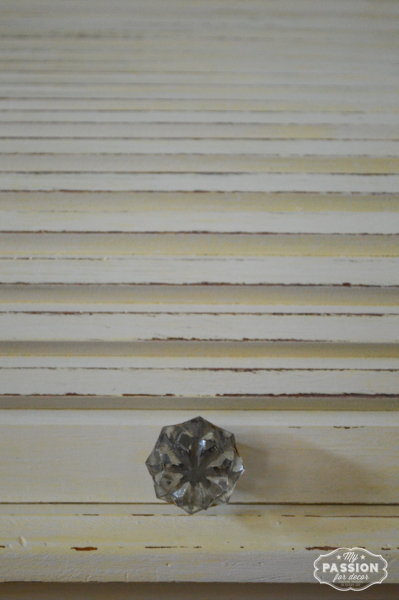 Once the Cream Chalk Paint™ was done, I painted two coats of the Cream, I took some Off White Chalk Paint™ and brushed the paint over in a cross hatch pattern with a small wallpaper brush. I wanted to give the pieces some depth. The final steps were to wax the pieces with Annie Sloan Soft Clear Wax, then lightly distress using 220 grit sandpaper. 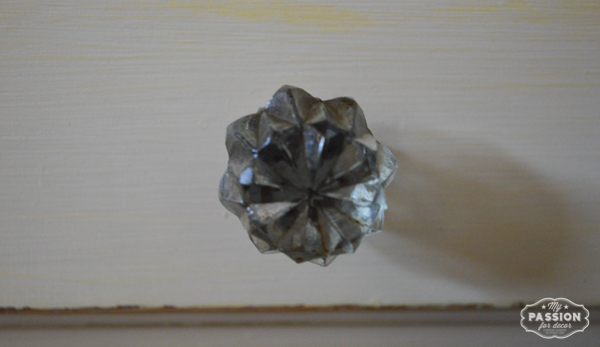 I also replaced knobs with glass knobs. 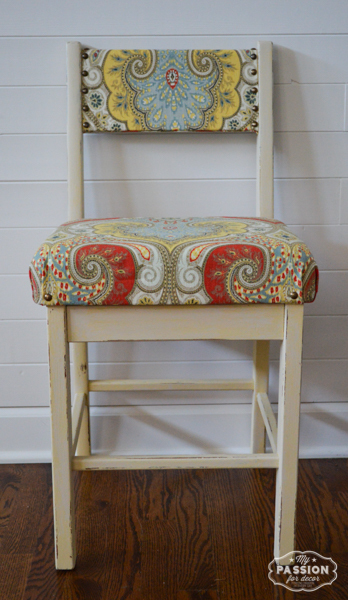 After I finished the chair, I knew I wanted to upholster the seat. No one likes sitting on a wood chair at a desk for very long! 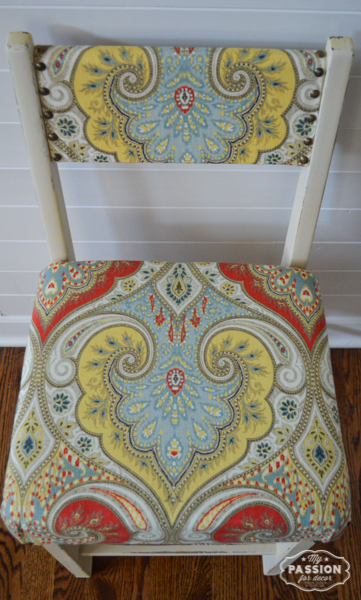 I had some beautiful fabric on hand that I hadn't used yet and it was exactly what the chair needed. 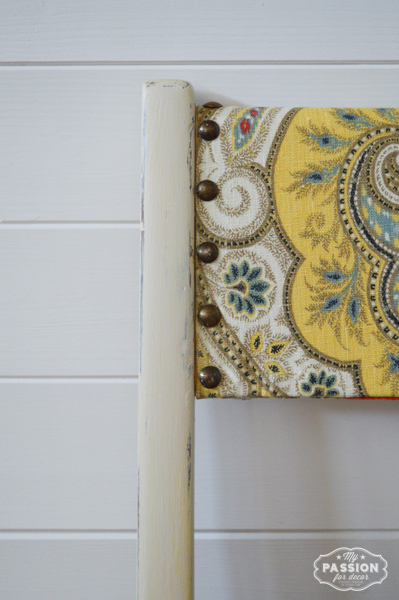 The fabric works so well with the chair you'd think I planned the paint color before...but hey sometimes a girl can get lucky, right? Luckily the seat was attached underneath with screws so I was able to remove the seat easily. 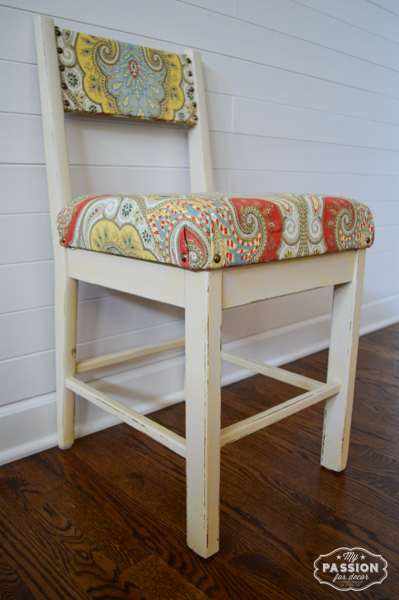 I added foam and batting to the seat, then covered the seat in my fabric and attached it with my staple gun. 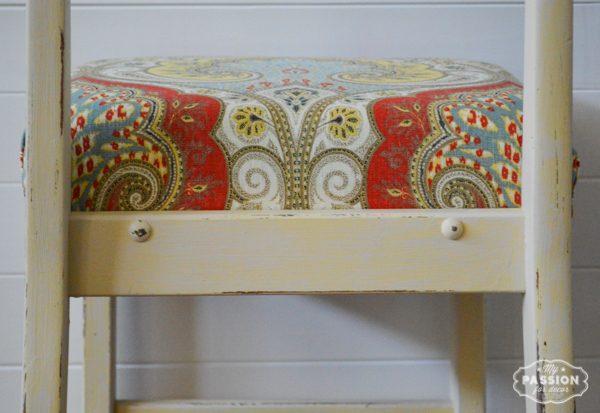 The very last step was to upholster the wood back of the chair with a bit more fabric. I then added nail heads. I added the nail heads to the front and back of the chair back and a few around the corners. I was now done...time to step back and take a look! I loved what I saw....and couldn't believe the transformation. Here's an up-close picture of the fabric. And here it is....the final project. I wish I had a little girl!! 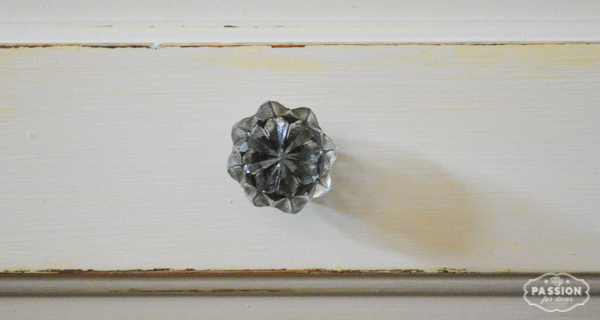 I love these glass knobs with this color! 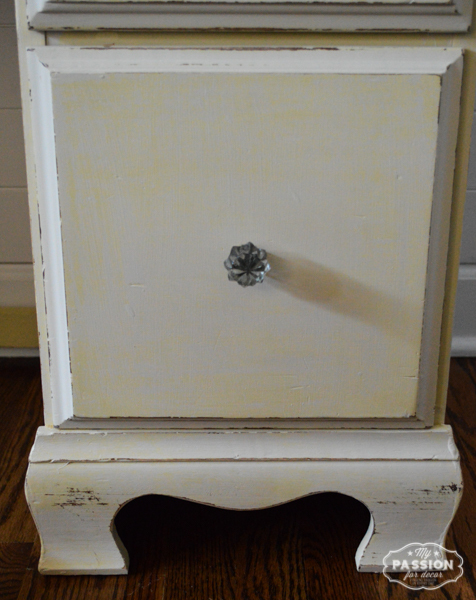 Also you can see the Off White Chalk Paint™ I brushed over top the Cream in this picture. 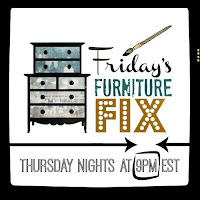 Now for some pictures one of my favorite chair makeovers ever! I'm a sucker for nail head detailing on furniture. I added the nail heads all the way around the back of the chair. These little wood circles were already on the chair and they went great with the nail head theme! I hope you liked this makeover as much as I do. Funny story, yesterday Hunter sat in the chair and looked at the desk then told me, "You are NOT selling this desk! I want it." Well, first off I told him it's a bit girlie for him, plus he already has three desks. He won't let me sell any of the three either. I'm flattered and love that he wants to keep everything Mom works on, but hey kiddo we only have so much room! Do you love desks as much as I do? I have another one in my basement that's waiting for a makeover so stayed tuned folks! I love it! I have a roll top and wondered how the rollie part would paint. Thank you!!! 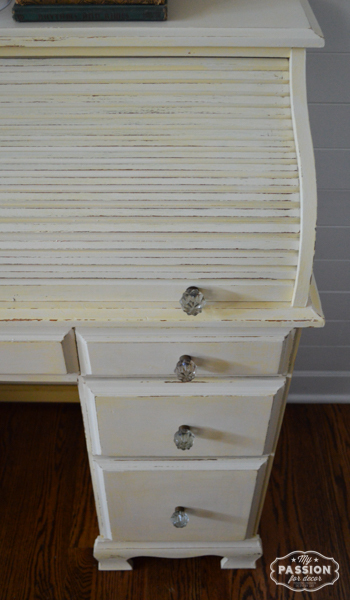 If you paint yours, just be careful not to get paint stuck in the sides where the roll top glides. I sanded them down a few times then added wax to help them glide better. Works perfectly! 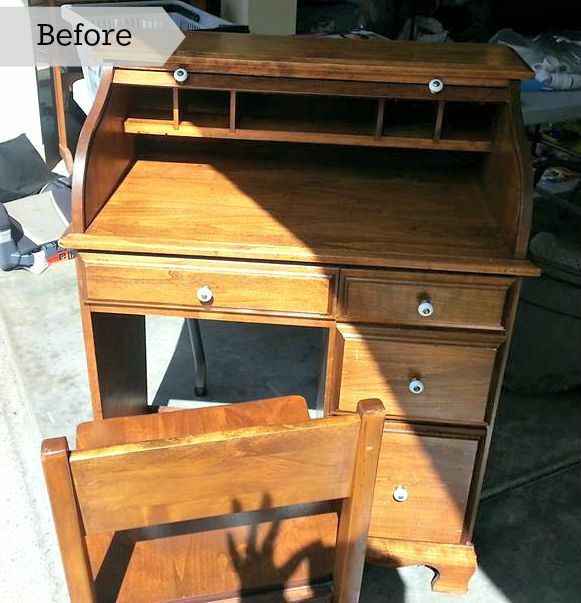 That's a beautiful transformation! 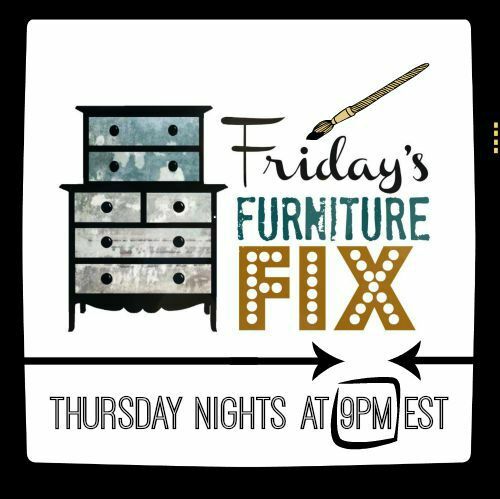 I found you at the new Friday Furniture Fix linky party, where I also linked one of my favorite furniture projects. Thank you so much Doreen!! I'll have to go by and check out your project too! This is reallybeautiful..I love how the creamy color of the furniture compliments the tones of the fabric. You did a great job and also the tutorial was very helpful! I am also in the midst of painting a dresser with chalk paint but I may have added toomuch water and now I'm on my 4th layer with no end in sight...sigh. Thanks for the much needed inspiration! Thank you Mary! 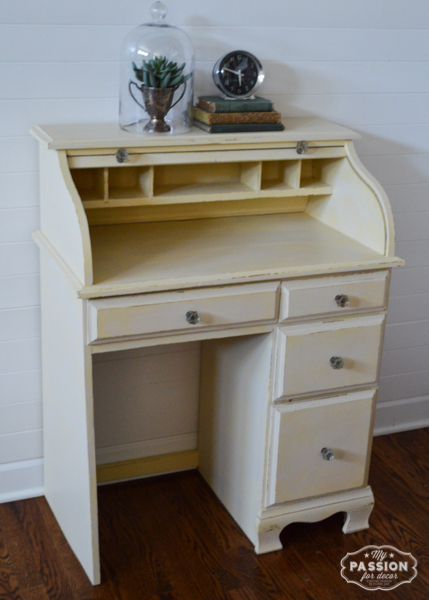 Cream is one of my favorite Chalk Paint™ colors! I hope you can figure out your project soon. What paint are you using? Your taste, style and talent always amaze me. Rock on girl. Oh my goodness I am in love with that fabric....like I need it!! That is a sweet little desk! Nice job friend!! Thanks so much Lynn! I am in love with that fabric too! 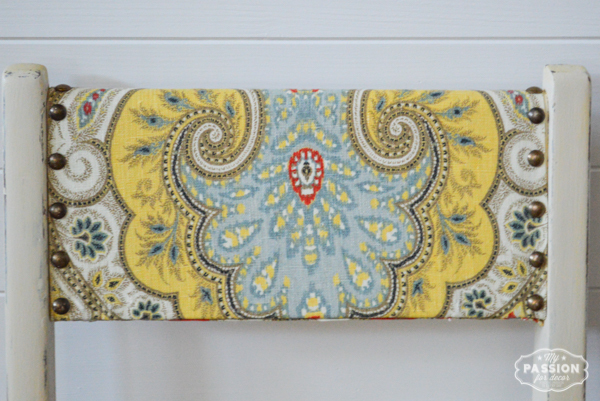 I bought a ton of it on online fabric store awhile ago to make roman shades with and went a different direction. Now I need to figure out what to use it on next!! Yes!! I do love it. Your style matches mine. 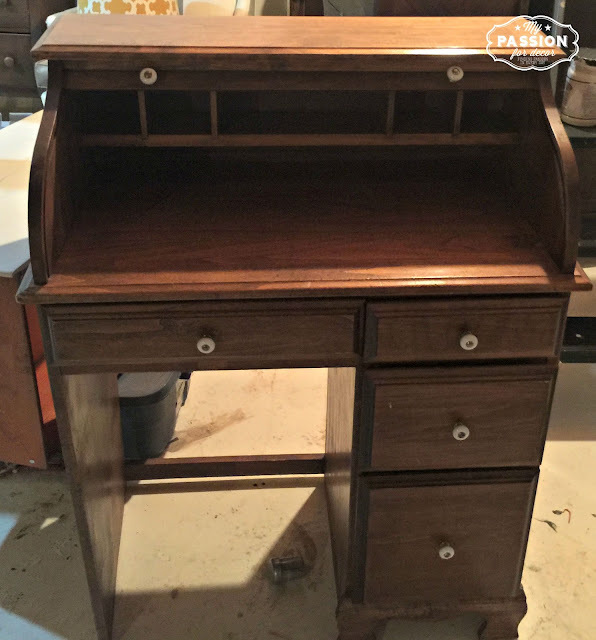 But my roll top desk is the oak supersize and my husband simply loves its oak wood (lumber yard owner's son!). 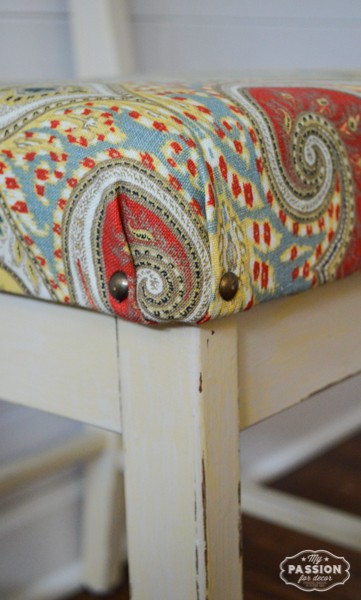 But I think the chair fabric is super fun too. A nice pairing. Visiting from Treasure Box tuesday linky... great job! 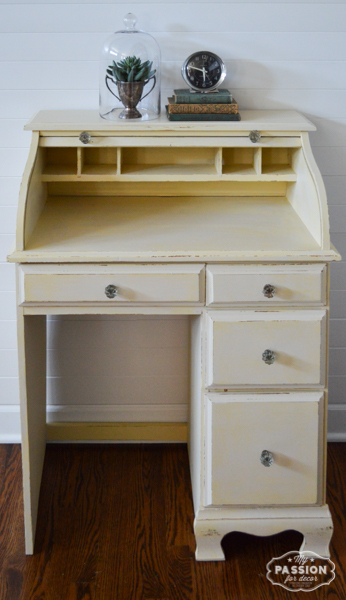 I have one like it, only without the side drawers and love it...so do my grand daughters! It is the first thing they run to when they come visit as each has a "cubby" in the top part for their own "special" things! 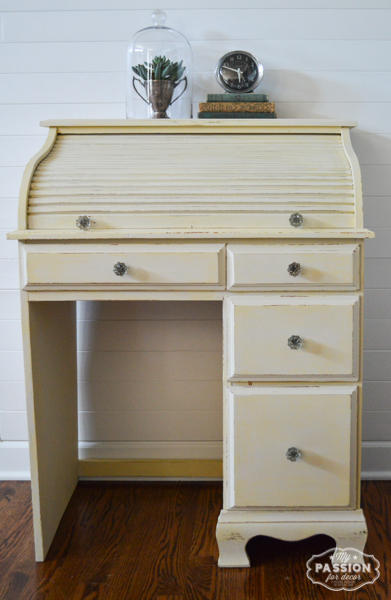 Love roll tops desks, and what a beauty this one is, especially after the transformation. Really nice, and you did a great job with the chair as well, Both looks awesome. 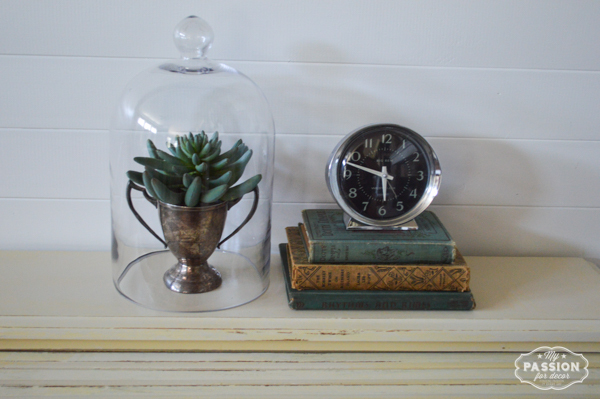 Like the glass knobs too. 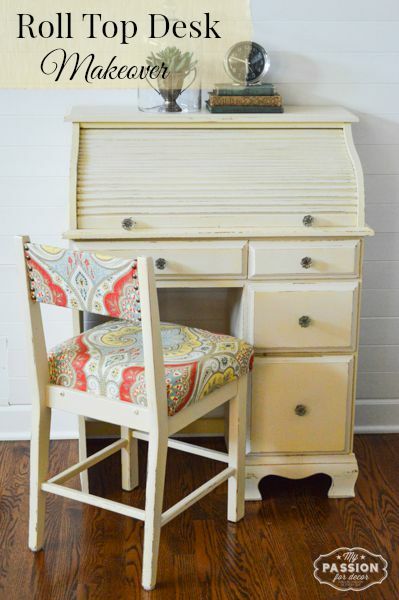 This is beautiful, I absolutely love how your upholstered the top of the chair :) Thanks for the inspiration! 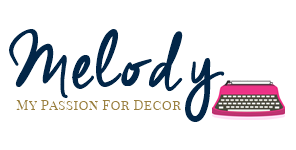 Melody, my first time here! 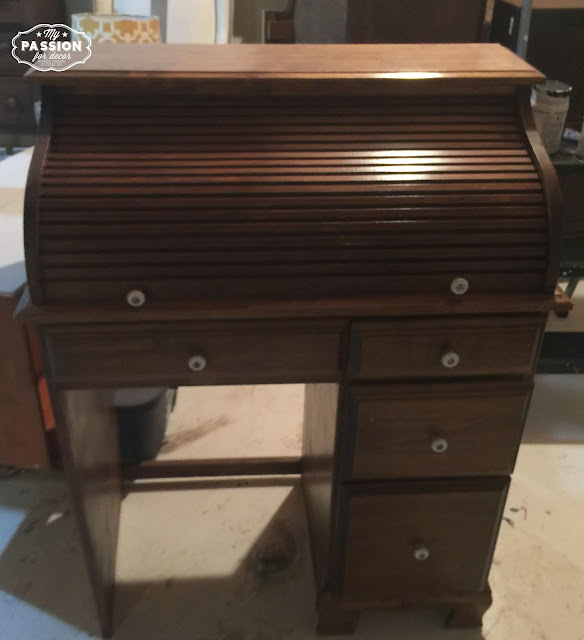 I love your makeover on this roll top desk. I have always wanted to refurbish one! Good job! Please share on Idea Box link party if you haven't already. 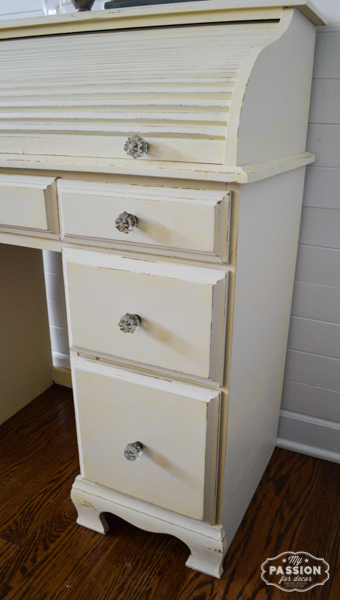 Do you have to sand the wood before your paint with chalk paint?